This premier 18-hole Championship Golf Course set in 260 acres of rolling parkland on the shores of Clew Bay, was designed by the renowned British firm of course architects Fred Hawtree and Sons. Measuring 7,072 yards par-73 with a standard scratch of 74 off the back tees. Its signature hole is the par-5 fifteenth, 580 yards index 9, where the tee shot is a long carry over Clew Bay. Westport Golf Club was awarded the Smurfit Irish Professional Championship in April 2002, won by Ryder Cup Hero Paul McGinley who set a new professional course record 65 in the 3rd round. It has been the venue of the Irish Amateur Close Championship on three occasions in 1977 when it, was won by Mark Gannon (Co. Louth) in 1985 when it was won by Denis O’Sullivan (Cork) and again in 1997 when Ken Kearney (now playing out of Roscommon). In 1989 Mary McKenna lifted her 8th Irish Women’s title at this venue. Westport can be a very demanding course in wet weather, demanding long irons and fairway woods on most holes. Regardless of the weather, a crisp Atlantic breeze is always present.Situated at the mouth of island-studded Clew Bay, where it is said there is an island for every day in the year, Westport is the most popular holiday resort in the West of Ireland and coupled with this Championship Course, in the shadow of Croagh Patrick, it make an ideal base to play the many other fine courses within easy reach. Opened in 1973, the maturity of the course and the continuing upgrading of the course and facilities makes Westport among the best that Ireland has to offer. 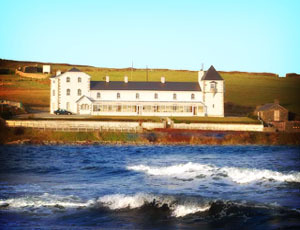 It has a fine clubhouse and the visitor is assured of a warm West of Ireland welcome and a memorable game of golf. In the clubhouse there is a magnificent oil painting by Irelands best golf course artist John McNulty and you can purchase a signed limited edition in the Pro Shop. Voted the No. 48-ranked golf course in Ireland, by “Golf Digest Ireland” in 2008. Westport was voted No. 26 Links/Shoreline Course in Ireland by "Backspin" Irelands leading Golf magazine in 2008, the panel comprised of a selection of 52 Professional and amateur golfers throughout Ireland. Instituted 1908, affiliated 1927. The "Irish Golfers Guide" 1910 gives an instituted date of 1908 for Westport and reports "The course was nine-holes, two and a half miles from Westport Station. The Captain is given as W. H. Darley-Livingston, and the Hon. Secretary is A. G. Simpson, of the Bank of Ireland". It would appear the club had some difficulties during the war years. In 1926, the club was restarted when a nine-hole course was opened at Carraholly, three and a half miles north of Westport: sometime between 1926 and 1939 the club extended to eighteen-holes. In 1973, the club relocated in its present home where eighteen of the finest links holes are to be found. The Irish Close Championship was played here in 1997, 1985 and 1977. Westport Golf Club won the Connaught Final of the Irish Junior Cup when they beat Ballinasloe Golf Club by 3 and halve matches to 1 and halve matches at Enniscrone Golf Club on the 12thAugust 2006.It was back to Enniscrone Golf Club for the National Finals, where they where drawn against Leinster Champions Castle Golf Club in the All-Ireland Semi-Final on Wednesday 13thSeptember.